Rashad grew up in Lynchburg, Virginia and was 6 years old when his mom signed him up for peewee football. Because of his size, Rashad was bumped up to the 8 and 9 year olds. As he got older, Rashad struggled to breathe from asthma (a condition he was diagnosed with by the time he was in kindergarten), was overweight and wore glasses. School was always a challenge because he was diagnosed with a learning disorder that made it difficult for him to read. When he was 13, Rashad says his dad was smoking in the house even after doctors issued a warning for Rashad to stay away from cigarette smoke. “It seemed like his cigarettes and alcohol were more important to him than I was,” says Rashad. That day, Rashad confronted his dad. Dad, can you stop smoking and drinking? If not for yourself, then for me? His dad asked him what he wanted to be when he grew up. Rashad told him he wanted to be a running back in the NFL. His dad told Rashad that he couldn’t make it to the NFL without drinking and smoking, too. To prove him wrong, Rashad told his dad he would never drink or smoke a day in his life. “Making that vow to my dad was one of the if critical moments for me,” says Rashad. “Maybe my biggest.” Little did Rashad know that the promise he made that day saved his life and later would save his dad’s. Growing up, Rashad lived in the shadow of his two older brothers who had not only gone to college but both played in the NFL. Throughout high school, when Rashad wasn’t working on his football skills, he was working on his grades. In 9th grade, Rashad’s brother, Butch, now a minister, received a prophecy from a visiting preacher that he needed to cover his younger brother like a father would. Butch had no idea what the Lord had in store for Rashad, but as a man of faith, he was excited about whatever it was. Butch moved from Raleigh, NC back to Lynchburg so he could support and mentor Rashad. As a junior, Rashad attended football camp at the University of Pittsburgh and was offered a full scholarship to attend the school. By the time he graduated high school, Rashad received offers from Pitt and Virginia Tech and chose Pitt. During his freshman year in 2006, Rashad’s dad had diabetes and it had gotten worse. Doctors had to amputate his dad’s leg. While he loved playing for Pitt, Rashad transferred to Liberty University to help out with his father (who quit drinking and smoking when Rashad was 21). During his senior year at Liberty, he was scouted by the NFL and was drafted in the seventh round of the 2009 NFL draft by the Jacksonville Jaguars. After his contract ended 4 years later, Rashad got a call from the Oakland Raiders and played with them for a year before signing with the New York Giants. Because of his dad’s amputations and a subsequent stroke, he had only attended one of Rashad’s pro games. In one of his games, Rashad achieved a career high in rushing, as well as most yards in a game, making him the leading rusher in the NFL. During a post-game interview, Rashad said he played the game with his dad in mind, told the audience about his imitations and how he wanted to use his body to honor his dad. After that, Rashad called his dad. Without hesitating, he said, Rashad, I’m so proud of you. “I didn’t hear those words often from him,” says Rashad. “But they meant the world to me on those rare occasions I did.” Six weeks after that interview. Rashad’s dad showed up at his game against the New Orleans Saints as a surprise. In 2016, he was released from the Giants and returned to Florida for training. “I like to pick up new hobbies during the offseason and decided on ballroom dancing,” says Rashad. The day after he signed up for lessons at a local studio, he got a call from Dancing with the Stars. He agreed to be on the show and won the coveted trophy for Season 24! Last year, Rashad was asked to be the commencement speaker at his alma mater, Liberty University. BIG DREAMS Rashad grew up in Lynchburg, Virginia and was 6 years old when his mom signed him up for peewee football. Because of his size, Rashad was bumped up to the 8 and 9 year olds. 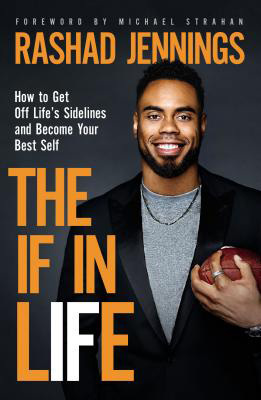 In his first ever book, The IF in Life: How to Get Off the Sidelines and Into the End Zone, NFL running back and Dancing with the Stars champion Rashad Jennings shares his inspiring story and experiences, imparts practical advice, and encourages readers to follow their dreams. 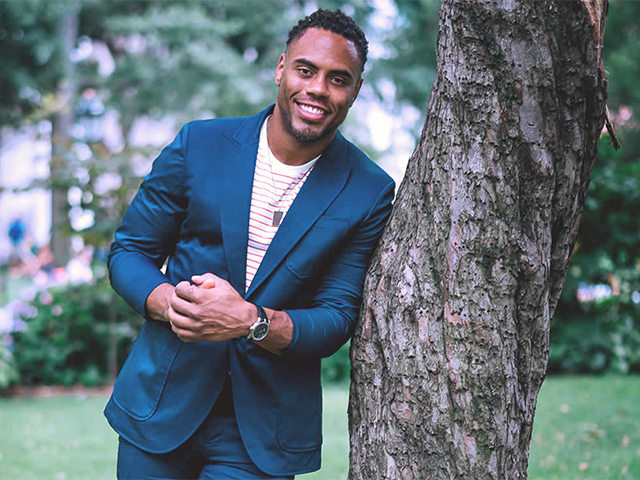 As a kid, Rashad Jennings dreamed of one day playing in the NFL, but the odds were stacked against him--he was an overweight kid with glasses, asthma, and a 0.6 GPA.